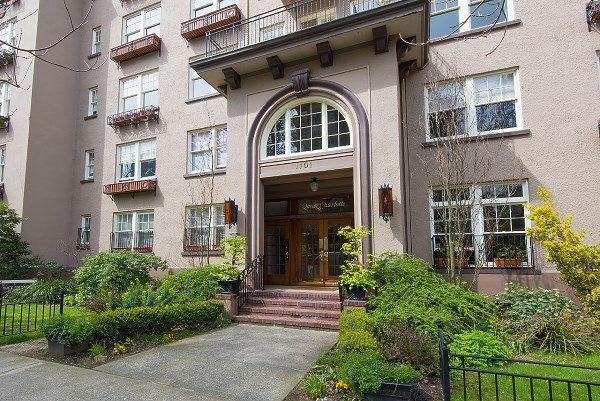 Two bedroom corner suite in premier Vancouver Heritage strata building "The Queen Charlotte". This 4th floor suite offers a beautiful outlook over the Westend to downtown and the North Shore mountains. The suite has retained all the classic detail with modern comforts including a redesigned kitchen and bathroom. Both bedrooms can accommodate king size beds. Hardwood floors throughout, 9 ft ceiling height, custom millwork with built in hallway bookcase. Heritage Award - City of Vancouver. Pet friendly. Call to view.